The bed and breakfast is a 3-minute walk to Nanluoguxiang, a 5-minute walk to Drum and Bell Tower and a 10-minute walk to Beihai Park. Jingshan Park is 15 minutes' walk away. Forbidden City and Tiananmen Square are about 3 km away. Beijing Capital International Airport is 22 km away. Lama Temple is a 7-minute driver away. Fitted with hand-carved Dynasty-style furniture, each room here will provide you with air conditioning. There is also an electric kettle. Featuring a hairdryer, private bathroom also comes with free toiletries and slippers. Extras include a safety deposit box and cleaning products. 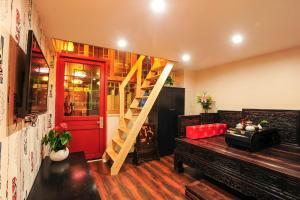 At Mao'er Hutong B&B you will find a 24-hour front desk and a terrace. Other facilities offered at the property include a shared lounge, ticketing service and a tour desk. The property offers free parking. Please inform Beijing Rong Courtyard Boutique Hotel in advance of your expected arrival time. You can use the Special Requests box when booking, or contact the property directly with the contact details provided in your confirmation. Цена: CNY 440.55 ... CNY 769.92; select dates below to get current rates.